‘All men are equal but some are more equal than others’ pace George Orwell that is what we discover in The Valley of Masks. 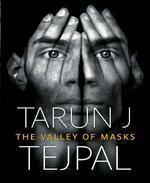 Tarun Tejpal sets his ideal world in a cup of the Himalayas, territory he’s visited before in The Alchemy of Desire. Of course, he is careful not to name the names of places, but one can guess from the descriptions of the scenery, the deodar trees and the fact that the prophet who rules this lost valley is called Aum. All the boys in this valley have names taken straight out of the Mahabharata. The narrator who tells the story through his own experiences is Karna. And later, when he takes an ‘alphanumber’, as one of the purest of the pure, the Wafadars, he is known as XX470 – at that stage, names do not exist. Like the Hashashins of El Alamut, the Wafadars are a unique band of ‘holy warriors’ who are invincible. Their weapon of mass destruction is the ‘chonch’, pins made of hardwood which drain the blood out of the veins and they can weave poetry in the air with these pins that can destroy anyone who comes up against them. According to the laws of Aum, they must be sent out against anyone who has lost his basic purity, who has given in to the impulses of his ego – as in the case of one of their prime warriors who makes the mistake of falling in love and who has to be exterminated. Through his imagination, Tejpal creates a universe that invites readers to wander through the mazes of their own conjectures. In this world, drinks have names like Ferment and Vapours. Women are kept in the Serai of Fleeting Happiness or the Kiln of Inevitable Impulses where young men and exhaust their sexual desires and learn not to be enthralled by any one body or face. Punishment is delivered in the Room of Inner Truths and repentance in the Crater of Resurrections and everyone waits for Judgement Day, when renegades are sentenced. Set against this are glimpses into every day world where a woman with grey hair holds Karna’s love and she in her imperfection is more beautiful than anyone he has ever encountered in his serais and kilns. And that world is set in a city with pigs and dogs jostling for the scraps that Parvati throws out morning and evening so that she can earn ‘good karma’. If Aum’s world is in the high mountains, the city’s seems to be the lower depths with a drain inspector thrown in for good measure, a man who tries to inculcate equality between his wife and his sewer men. Occasionally the laws of Aum may seem a little too long and the death toll too violent, but the fable that Tejpal expounds is a universal one with an interesting Indian subtext that touches on casteism and epic myth with thriller undercurrents. Read it for the 21st century spin he puts on Orwell’s theme. One Comment on "Laws of the Order"
Hello, I am payal, a bookworm and a blogger too. I have read this book, so I definitely enjoyed reading about your take on this one. If you are interested you can read about my opinion on this book by visiting my blog.